Metal Tech 4x4 FJ40 Land Cruiser full profile roll cage kit. With 12 years of leading the industry the best roll cage possible this kit will provide you with maximum amount of head and foot room. 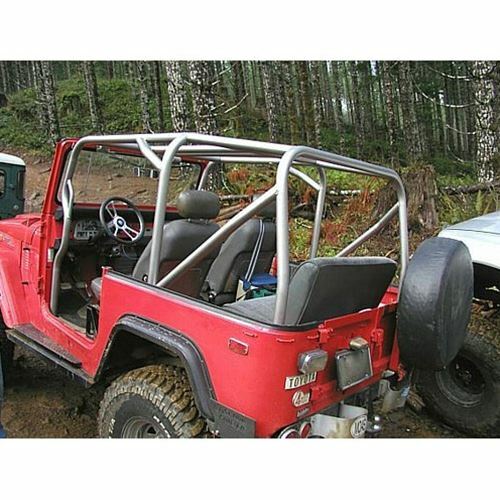 Metal Tech 4x4 FJ40 Land Cruiser roll cages will fit the factory hard top and any aftermarket soft top. Our roll cage kits can be installed in any year FJ40 from 1963-1984 and are designed to be custom fitted to your specified year. We purposely leave some of the roll pieces extra long for the ability to customize our cage to your preference. Our roll cages are made out of 2 x .120 DOM SRA tubing that is custom made to our specifications. While regular DOM tubing has a elasticity of 10-12% ours yields 20-24% elasticity that will take more impact in the event of a roll over. Don't be fooled by other competitors that use 1 3/4" x .120 tubing as it is not the specified tube diameter for vehicles over 4,000lbs gvw. Metal Tech 4x4 roll cages are in compliance with SCORE racing standards. Please note this product requires cutting and grinding to fit together! You must email [email protected] for shipping quote.